I’m a pretty easy going gal about most things in life. Becoming a mom has taught me to roll with the punches and to pivot a little more gracefully when things don’t go as planned. One thing I’m completely unbending about is how I like my scones. 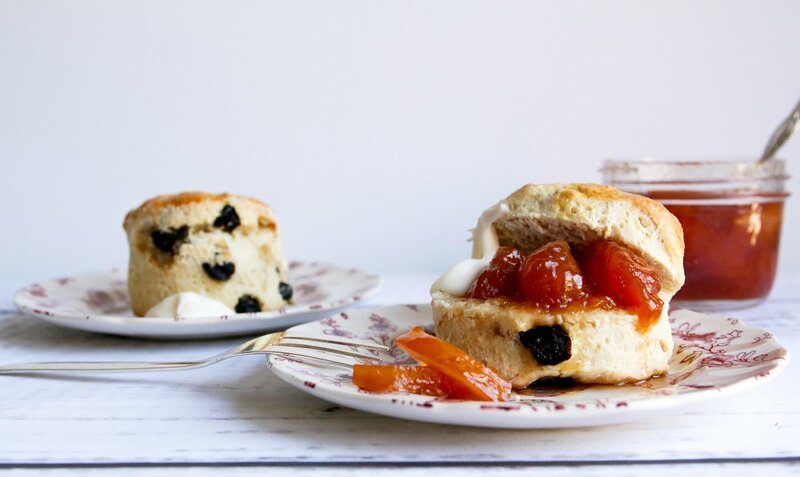 It’s not that my preference is the guiding light of how a scone should taste, it’s just my preference and I politely decline most scone offerings. There are so many renditions of scones, sweet, jam filled, chocolate chip studded, glazed with a thin sugared frosting! Whoa! I think all of that is fine and dandy but I’ll take the polar opposite please. I like a scone that is less sweet and has a crumbly density to it. The opposite of a flaky, light biscuit. Something with layers that can hold all the amazing toppings I’ll be spreading on them. As for additions, I’m perfectly happy to eat a scone without any, or a handful of dried fruit. What I do love on a scone is plenty of jam ( my go to is actually marmalade) and/or butter or clotted cream. 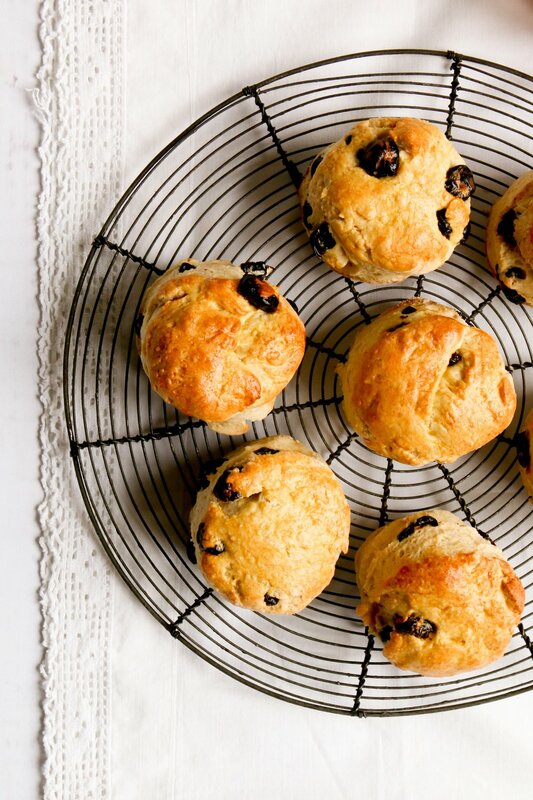 That’s the beauty of a less is more scone, you can add the ratio of goodness that suits your own palate. Tart jam, extra butter, just a scosche of cream, it’s a win win! These little beauties are best eaten the day they are made. You can always do the prep work ahead of time and then bake them off the day you are planning to serve them. I like my scones round, only for the function of slathering on the toppings later ( I can halve them easily) and they always seem to be just the right amount. This recipe was adapted from one of my favorite baking books, What to Bake and How to Bake It. If you are into baking or wanting a good cookbook with great insight into baking I would highly recommend this book. It has served as a great reference tool for me throughout my years of baking. I would love to hear how yours turn out, what additions you added or if you just made them plain. Either way, I know they’ll be delicious. Preheat oven to 425 degrees F. Put a large baking sheet in the oven to heat up. Mix the flour, baking powder, baking soda, and salt , then sift into a large bowl. Cut the butter into cubes and add it to the bowl. Rub the cold butter into the flour using your fingertips, until it looks like breadcrumbs. If you have a food processor, process the butter into the dry ingredients instead, then pour into a large bowl. Stir in the sugar and the dried fruit. Heat milk in a small pan until warm. then add lemon juice and vanilla. Let sit for a few minutes until it turns a little bit lumpy. Beat the egg, then add 2 tablespoons of it to the lumpy milk mixture. Set the rest of the egg aside. Pour the scoured milk evenly over the dry ingredients, working it into the flour with a table knife. Keep mixing until all the liquid is incorporated and you have a soft, rough dough. Flour your hands and the work surface thoroughly. Turn dough out onto it and sprinkle a little flour on top. Fold dough over itself a couple times just to smooth it, then pat it into a 1 1/4 inch thick round. Try to make sure the smoothest part of the dough ends up on top. Using a 2 1/2 inch round cookie cutter, cut out 6 scones. Dip the cutter into some flour between each cut to prevent it from sticking. Carefully press remaining dough together and cut out the rest. Brush tops of scones with some of the remaining egg. Remove hot baking sheet from oven and sprinkle it with flour. Carefully place scones on it, spacing them out evenly. The heat will give the scones a hard set. Bake for 12 minutes, or until golden and well risen, and sound hollow when tapped underneath. You may need to turn the pan around after 8 minutes to ensure an even color. Cool on a wire rack.